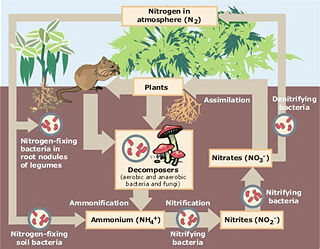 Schematic representation of the nitrogen cycle. Nitrogen fixation is the process by which nitrogen is taken from its relatively inert molecular form (N2) in the atmosphere and converted into nitrogen compounds useful for other chemical processes (such as, notably, ammonia, nitrate, and nitrogen dioxide). Because atmospheric nitrogen (N2) does not react with other compounds, nitrogen fixation is necessary, as it is an essential nutrient for all living things, including serving as part of nucleic acids and amino acids. Nitrogen fixation is performed naturally by a number of different prokaryotes, including bacteria. Many higher plants, and some animals (termites), have formed symbiotic associations with these microorganisms. Most species of legumes, for example, provide a habitat for nitrogen-fixing bacteria, and receive a usable form of nitrogen as a benefit. Human beings have contributed to nitrogen fixation, expressing their creativity by converting N2 to NH3, using fossil fuel as energy. However, the use of such chemically produced nitrogen in fertilizers and munitions have also been expressed in ways that have increased pollution (such as eutrophication of lakes from runoff of excess fertilizer) and war casualties. Although ammonia (NH3) is the direct product of this reaction, it is quickly ionized to ammonium (NH4+). In free-living diazotrophs, the nitrogenase-generated ammonium is assimilated into glutamate through the glutamine synthetase/glutamate synthase pathway. Biological nitrogen fixation was discovered by the Dutch microbiologist Martinus Beijerinck. The best-known plants for fixing nitrogen are legumes (such as clover, beans, alfalfa, and peanuts). These contain symbiotic bacteria called rhizobia within nodules in their root systems, producing nitrogen compounds that help the plant to grow and compete with other plants. When the plant dies, the nitrogen helps to fertilize the soil. The great majority of legumes have this association, but a few genera (for example Styphnolobium) do not. Crop rotation is often used in agriculture to maintain adequate nitrogen levels in the soil for crop productivity. In this process, leguminous plants, such as alfalfa, are planted in rotation with food crops to replenish nitrogen levels in the soil. Nitrogen can also be artificially fixed for use in fertilizer, explosives, or in other products. The most popular method is by the Haber process. Artificial fertilizer production has achieved such scale that it is now the largest source of fixed nitrogen in the Earth's ecosystem. The process was first patented by Fritz Haber in 1908. In 1910, Carl Bosch, while working for chemical company BASF, successfully commercialized the process and secured further patents. It was first used on an industrial scale by the Germans during World War I: Germany had previously imported "Chilean saltpeter" from Chile, but the demand for munitions and the uncertainty of this supply in the war prompted the adoption of the process. The ammonia produced was oxidized for the production of nitric acid in the Ostwald process, and the nitric acid for the production of various explosive nitro compounds used in munitions. The Haber process now produces 500 million tons of artificial fertilizer per year, mostly in the form of anhydrous ammonia, ammonium nitrate, and urea. One percent of the world's energy supply is consumed in the manufacturing of that fertilizer (Smith 2002). That fertilizer is responsible for sustaining 40 percent of the Earth's population. The reaction of nitrogen and hydrogen is reversible, meaning the reaction can proceed in either the forward or the reverse direction depending on conditions. The forward reaction is exothermic, meaning it produces heat and is favored at low temperatures, according to Le Chatelier's Principle. Increasing the temperature tends to drive the reaction in the reverse direction, which is undesirable if the goal is to produce ammonia. However, reducing the temperature reduces the rate of the reaction, which is also undesirable. Therefore, an intermediate temperature high enough to allow the reaction to proceed at a reasonable rate, yet not so high as to drive the reaction in the reverse direction, is required. Usually, 450 °C is used. High pressures favor the forward reaction because there are 4 moles of reactant for every 2 moles of product, meaning the position of the equilibrium will shift to the right to produce more ammonia. So the only compromise in pressure is the economical situation trying to increase the pressure as much as possible. Usually, 200 atm is used. The catalyst has no effect on the position of equilibrium; however, it does reduce the activation energy of system and hence in turn increase the reaction rate. This allows the process to be operated at lower temperatures, which as mentioned before favors the forward reaction. The first Haber-Bosch reaction chambers used osmium and uranium catalysts. However, today a much less expensive iron catalyst is used almost exclusively. The ammonia is formed as a gas, but on cooling in the condenser liquefies at the high pressures used, and so is removed as a liquid. Unreacted nitrogen and hydrogen are then fed back in to the reaction. Smith, B. E. 2002. “Nitrogenase reveals its inner secrets.” Science 297 (5587):1654-1655. This page was last modified on 15 October 2016, at 20:32.